Marbella Lakes is an intimate Southwest Florida community of on the east side of Livingston Road directly across from Grey Oaks and Kensington. Wyndermere is Marbella Lakes’ immediate neighbor to the south. The gated community entrance is less than a two-mile drive from Exit 107 on Interstate 75 east of Naples. Yet Marbella Lakes is only five miles from Clam Pass Beach and the Gulf of Mexico. 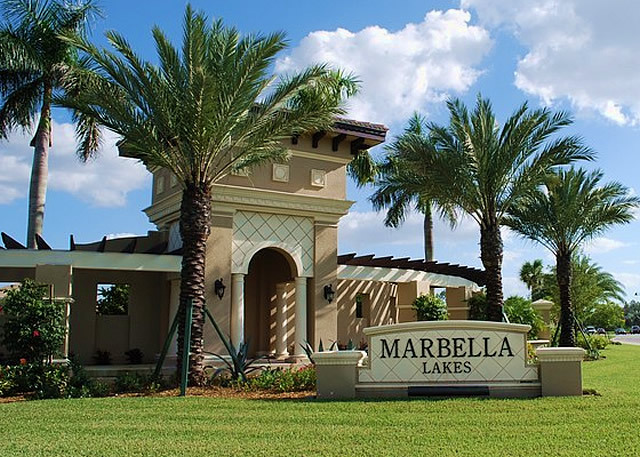 Marbella Lakes has 490 homes and home sites, including 208 carriage homes and 282 single-family homes available in a variety of floor plans and sizes. The community is built around seven sparkling lakes. The 8,000 square foot clubhouse features both an indoor and an outdoor sports complex. The outdoor activities include a serene, free-form, 75-foot pool that is 57 feet across at its widest point. There is also a kids’ pool and a spa with the palm-line deck area. Two tennis courts, a full basketball court, a Tot-Lot, and a barbeque area add to the clubhouse amenities. Marbella Lakes MLS Listings - Updated Daily! The Catalina and Castilian collections are single-family homes ranging from 2,144 to 3,513 square feet. Aside from the two-bedroom plus den Santiago model, all other models have anywhere from three to as many as six bedrooms. All models in both collections have two or three-car garages. The nine models in the Catalina Collection range from 2,144 to 3,269 square feet. The Pamplona, the Madrid, the Montessa, the Granada, and the Avila are two-story homes with a minimum of 2,604 square feet under air. The Castilian Collection features five models, ranging from the 2,269 square-foot, three-bedroom, three-bathroom Andalucia to the 3,513 square-foot Montoro that comes in either a five or six bedroom plan with five bathrooms. The 3,095 square-foot Vizcaya and the Montoro are two-story homes. Each has a loft, which, in the Montoro, can be made into an optional sixth bedroom. There are two collections of carriage homes in Marbella Lakes. Each collection has several models. The Amalfi Collection includes the 1,534 square-foot, two-bedroom, two-bath Capri and its companion, Positano with 1,609 square feet. Both include a single-car garage. The Sorrento and Napoli are three-bedroom, two-and-a-half bath plans with 2,143 and 2,288 square feet respectively. The Napoli has the added convenience of a two-car garage. The Riviera Collection are Mediterranean-style three-bedroom homes, ranging from the 1,591 square foot Portofino and the 2,170 square foot Monaco. The Portofino and Monte Carlo have single car garages while the St. Tropez and the Monaco have two-car garages. All of the homes in Marbella Lakes are relatively new, having been built between 2009 and 2013. With the plethora of community activities, there is always something to fill any residents’ social calendar. Nonetheless, all of Naples is so accessible, that it can be difficult to stay at home. In the few years it has existed, Marbella Lakes is proving to be one of the Naples area’s most upscale, yet affordable communities. Paver walkways and driveways, screened and covered patios, tray or coffered ceiling in most master suites, and double door entries are some of the features that GL Homes has included in various models.